This Fall my church is going through the book of Joshua. It's been a fantastic series to see God's faithfulness to His people, His provision and His leading. On Sunday I preached on Joshua 20 and 21. I talked about how God is a refuge to those in need. Watch the sermon here and share your thoughts on how it impacts you. 11/27/2016 - Neal Benson | Ventures in Faith: Where Can I Run? from Central Peninsula Church on Vimeo. A few weeks ago I was invited to speak at Men's Fraternity at our church. It's a great ministry that meets at 6am. Me and 6am are not best friends. Thankfully there is warm coffee and a hot breakfast. Also there are almost a 100 other guys to keep you awake and make sure you're getting connected. It was a huge privilege to speak at Men's Fraternity. Here is a link to my talk from the morning about the power of a validating father. 11/17/2016 - Neal Benson from CPC Mens on Vimeo. Last weekend I had a really cool opportunity to speak at the church where I first met Christ. It was epic! Looking back on the weekend I have a handful of takeaways to share. Since I've been traveling a lot lately it seemed right to bring one of children with me. Charity and I talked about it and thought Leah needed the time with me. It was so fun to travel with Leah! We rarely get any one on time. This trip gave us a bunch of one on one time. We flew out of SFO together and traveled to my moms. Over the weekend it was great seeing my daughter enjoy my mom. Growing up in a small town I choose to leave after high school and have never moved back. Now that we have kids I cherish any time they get with my mom. As we planned the trip I had to reach out to some close friends to see them. My best friend Conrad came up to see us. It was great seeing him and his wife Karen. We also spent some time with their son Deagon. On Saturday we were able to see them, ride the Alpine Slide and go bowling! We also had some time to see my good friend Brian. Brian had been a brother in Christ for 15 years. Brian gave his life to Christ while we both were living in San Diego. He has four children now and it was so fun seeing how well our kids got along. We also had the opportunity to see more friends when I spoke at church on Sunday. At one point in the service I looked back at my friends and said: "It feels like high school!" It was so fun seeing so many friends in such a short time. A highlight of my trip was being invited to speak at the church I first was introduced to Christ at. When I pulled into the parking lot on Sunday morning I had to do a double take. Never in my life did I think I'd be speaking at that church. Before getting out of my car I just sat there and thanked God for the invitation to speak there. I'll admit I was nervous. Nervous for a few reasons. The people in my hometown know me. They know my mistakes and many of them saw them first hand. I was nervous they wouldn't see the change. I was wrongly nervous. I was so well received and was able to hug and see so many friends. I also saw Bob Pool. Bob was a huge impact in my life. Bob invested me in as a young boy and it was great seeing him! Looking back on the weekend it was a pure joy! It was great spending so much time with Leah, seeing old friends and sharing God's word with so many loving people. DO I NEED TO TAKE A DAY OFF? We live in a culture where it's hard to really take a day off. We are attached to our phones. It's tough to rest with kids. It seems there is always something to complete around the house. How does a person really take a day off and rest? What does the Sabbath mean? During Bible College was the first time I began to study the Sabbath. Sabbath comes from the Hebrew word Shabbat meaning repose. Repose is a state of calm, peacefulness or rest. The Sabbath means it’s our chance to have a day of calm with no regular work. From what I’ve read about history the Jews would start their day when the sun set. This way the first part of the day would be spent with the family. This is not necessarily a spouse and children; but time with their entire family. Next they would sleep and conclude their day with work. It’s a fantastic way to view the 24-hour day. To further help you understand what the Sabbath means let me explain a little more. The Sabbath is intended to be practiced weekly. One day a week is meant to be dedicated to the Lord. It’s a day where no regular work is to be done. Many people practice their Sabbath day on Sunday. This allows you to go shopping on Saturday, get the house chores done, wash the dog, clean your car and do other things that are work but not your regular job. If you don’t have Sunday off from your job you can be creative on what day you take. When I was in college I had Monday and Tuesday off so I would use Monday as my Sabbath day. The goal is not to be legalist on the day. Now there are some questions about what is really work. When we talk about the meaning of Sabbath it’s a complete stopping of work. I do my best to take my Sabbath from Friday night to Saturday night. It’s a time where I don’t check email, I won’t slot meetings, I don’t do laundry and I won’t write a sermon. What I will do is clean the garage, wash the car or do yard work. Those are things that don’t feel like work to me. I’m a little OCD so having a clean car feels amazing. When my garage gets cluttered it stresses me out. It’s tough to clean it on a week night so I need to wait until the kids are resting on Saturday afternoon so I can clean it. Yard work actually refreshes me and doesn’t feel like work. There is something, for me, about raking the leaves, trimming the bushes and helping my backyard look more presentable. For you, this may sound stressful. The point of the Sabbath is do no regular work and rest. These are not my regular work and refresh me. Once we understand what the Sabbath really means is when we can begin to figure out why it was given. 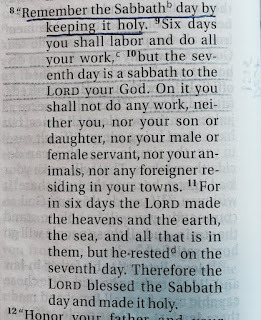 The first time the word Sabbath appears in the Bible is in Exodus 16:23. The Nation of Israel had been working their fingers to the bone. They were under the oppression from Pharaoh. They were required to make bricks so Pharaoh could expand his power and build up Egypt. God rescued His people from Egypt and after crossing the Red Sea the Lord commanded the people to take a Sabbath day (read Exodus 16:23). 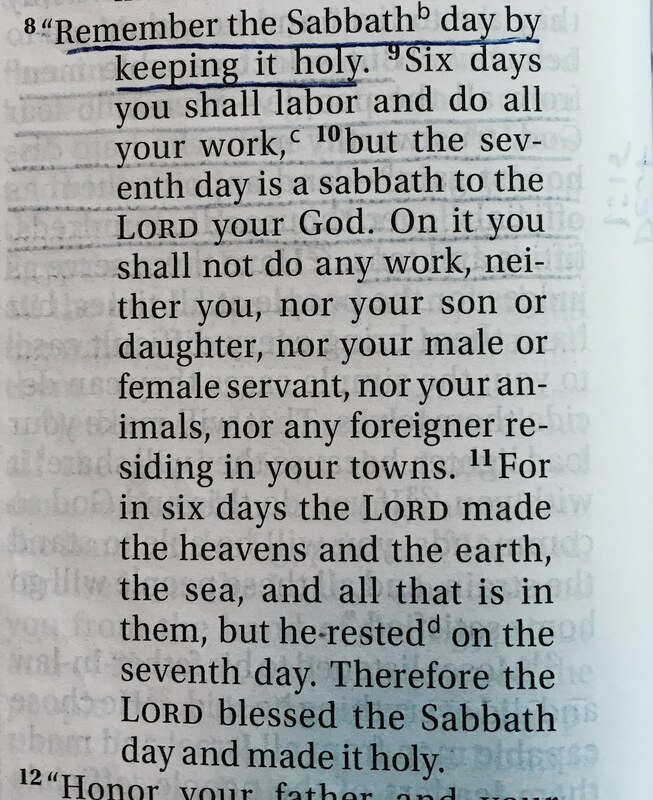 Although this is the first time the word “Sabbath” appears, the term “rest” is used earlier in the Bible. In Genesis 2:2-3 God saw all He had made, and then He rested. How come an all powerful, all knowing, God stopped to rest? God didn’t have to rest. The Bible doesn’t say that God was tired. The reason that God rested was to set an example for us. God modeled a rest-filled life for each of us. God knew that He created us as human beings and not human doings. The Sabbath protects people from burnout and being used for all they accomplish. During the aftermath of the French Revolution, the Sabbath was abolished, being substituted with one day’s rest in ten. Each person was expected to work for nine days and then take one day off. Apparently the experiment was a complete disaster. Men and women crumbled under the pressure and strain of the expectations. Animals were literally falling over in the street and dying for being pushed so hard. People need a Sabbath and that is why it was given. Let’s a quick recap from the first two questions. The first question was what does the Sabbath mean. Who can give me a sentence answer to that question? The Sabbath means to have a day of rest. The second question we grabbed from the fourth commandment is; “Why was it given?” Who can give me a quick answer to that question? The reason the Sabbath was given was so we can rest and not burnout from the load of work. The other day Leah came home from school and said, "Guess what?! I got JoJo!" JoJo is the huge jaguar you see in the picture. 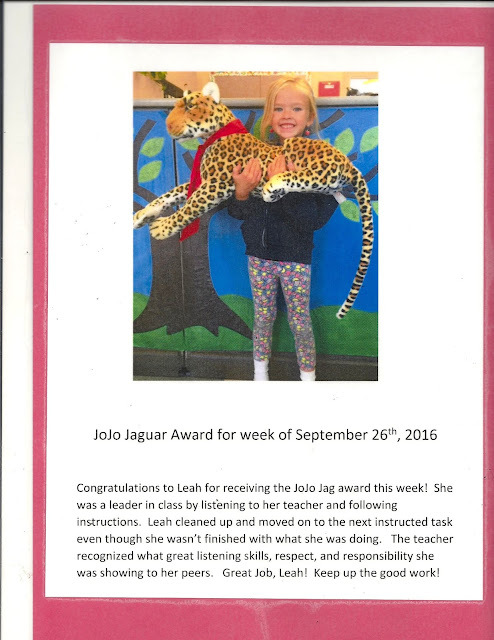 If you look at the write up on Leah you can read about why she got JoJo. I'm so proud of Leah for getting JoJo. I'm proud of her for listening and for her teaching seeing her notice. I love how big she is smiling at winning JoJo (this is a big deal at our school). For the last five(ish) years I've been wanting to get a tattoo on my left arm. When I say "a tattoo" I mean a half-sleeve. I am not one to simply rush into a tattoo. I know its something on my body forever and it matters. I have tried to find an artist near me but each time I think about calling I just think: "I want Jonny to do the tat." Jonny Five is my buddy in Vegas who has done basically all my ink in the last decade. I've spent many hours with Jonny and more importantly I trust him. He's a fantastic artist. He's well respected. He knows what he's doing. So all that said, let me explain the tattoo to you and the reason behind it. When I was in seminary I had a pastor I respect very much pray over me. During that time he prophesied and prayed that I would be a tree for my generation. He prayed I would be a father to the fatherless and a leader for leaders. He prayed that God would use me to fight for the fatherless. He also prayed that I would put down the gloves I've used to fight in the past and that I would fight for the Gospel to move ahead. It was a moving time. About six months after that I began thinking of getting a tattoo to remind me of that time. Each time I looked at trees I couldn't find the right one. After thinking about it for almost four years Charity and I were talking and it all clicked. I don't remember how the conversation went, but it was finally clear that I needed to get a pine tree (or some kind of mountain tree). It would remind me of my roots and the time in seminary. I love the dimension in the tattoo and the variety of trees. The main tree is dark black and then the trees vary from there. If you're familiar with Redwood trees you might know that they don't have deep roots but they have connected roots. The tree relies on its root connection to other trees in strong winds. This tattoo also reminds me of the need to stay connected with others. The Christian life is not meant to be experienced alone! There are the four reasons this tattoo is so meaningful to me. Thank you Jonny for a great piece! If you're ever in Vegas go hang out with Jonny and get the tattoo you've been thinking about for years. The longer I pastor and the most I parent the more I look for ways to empower parents to be spiritual leaders in their homes. I often find myself having conversations with dads about how they can connect with their kids. I talk with moms about how they can shape the hearts of their sons. I talk with grandparents who are filling a role and looking for creative ways to serve with their kids. "I know God better because of that." We want parents leaving the service thinking: "I can talk with my child about things of God because of that service." About two years I had an idea (this is normal occurrence in my life). Not all my ideas are good, but this one seemed to catch traction. The idea was to have my six year old daughter co-host with me in the service. To make this happen well I knew it would take lots of practice and preparation. I didn't just show up on Sunday morning with my daughter. We talked about it at home, we practiced on Thursday on the stage with lights and microphones, and then we did the real thing on Sunday. When it was all said and done it was a great time! We had a fantastic response from our body and my daughter loved it! I know many churches are thinking of creative ways to get kids and parents in the service together. If that is you, you might want to try something like we did! I want to say a special thanks to our Foster City team for dreaming always! Thank you to Mike Sly for the pictures of this special time with my daughter.